Safety and technology options | What Car? Radar-governed cruise control maintains a preset distance between you and the car in front on motorways and in traffic jams. Not cheap, and we're not that keen on it. The headlight beam aim follows the steering and varies light pools. Very useful and well worth the price. Projects speed, navigation directions, cruise control status and warnings close to line of sight on the windscreen. Useful safety feature, but very expensive and probably won't add much to your car's resale value. 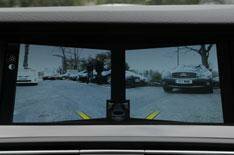 Monitors blind spots should come with lane-departure warning. Sounds a warning if the driver drifts out of their lane. Enhanced view appears in sat-nav screen (would be better in instrument pack), plus aural pedestrian warning. Pricey and of limited use. Parallel parks into suitable space. Good; comes with reverse camera. Projects rear view into nav-screen. This feature is useful for a big car in tight spaces, and comparatively cheap. Handy feature, which really should be standard. Comes with Professional Multimedia Navigation System only. Looks complicated, but provides superb aerial view of car and obstacles. Brilliant beams, but very expensive.